Wine Descriptions: Are They Accurate? Those of you who read the last few posts may have noticed a critical tone developing, maybe an irritation? I decided to write about something positive this week. That was until something happened that I just could not let pass without comment. Add this to the list of things related to wine that get under my skin. I was in a big warehouse club and I was just visiting the wine department to see if there were any deals. 2005 Chateau Pinchon Longueville Comtesse De Lalande. A quick scan with the smart phone revealed that the price for this wine ranges between about $150-$200. This is a serious wine. It was classified second growth in the Medoc classification of 1855. The price at this store was $99.97 Great! But then I noticed something. 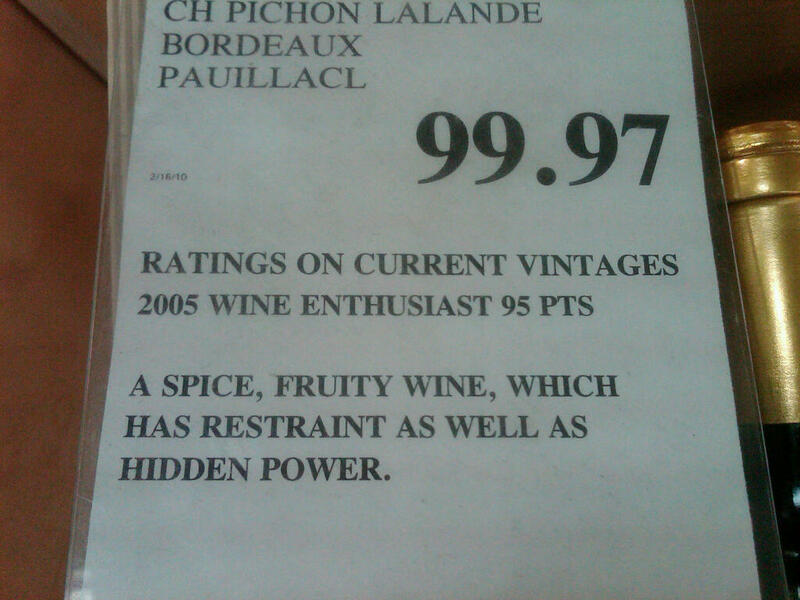 Spice, fruity, with hidden power. I would like to know where Pauliacl is. Is it related to Pterodactyl? I am a terrible speller, but c’mon! The rating, who gave this wine 95 points? There is a difference between 95 points Wine Advocate and 95 points Wine Spectator, and Wine Enthusiast. Who am I kidding, I’d buy 95 points from any of them, but it’s just nice to know. And then there is the flavor profile. At this point I just burst out laughing… With hidden power! It reads like a fortune cookie. Your future holds spice and fruit, and hidden power. I wish! This warehouse store is a multi billion dollar company, I think they can do better. This shows me, that maybe they are not really interested in wine, just making money from it. “This shows me, that maybe they are not really interested in wine, just making money from it.” Well, they are clearly not making as much as they might with a price like that! Hahaha. A Google search for “Pauliacl, France” only shows your article. I am now the worlds foremost authority on Pauliacl!